Microsoft says that Kinect is the next big thing for video games, a way to control both games and TV without touching a thing. This expensive future is now. It's amazing, but you can wait for it. 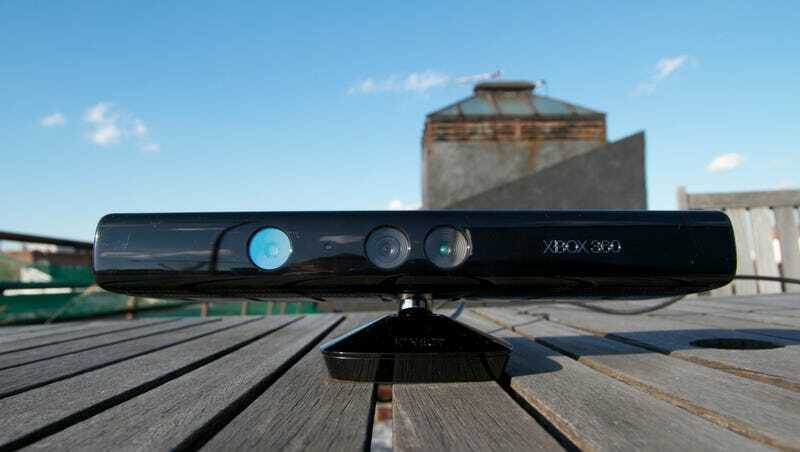 The Kinect sensor is a device that plugs into an Xbox 360 and uses a combination of cameras and microphones to identify and track the movements of a person standing in front of it, as well as enabling voice control of games and video running on your TV. Wave your hands to play a game? Get your posture corrected by a virtual personal trainer? Tell ESPN to pause? Kinect does that. Kinect's launch offerings have something for everyone, even those who don't play games, but, for now, Kinect is a device for people with extra money and — very important — a lot of room in front of their TV. A lot. Kinect isn't just hype. It is technology that goes beyond the microphones and cameras we've seen attached to game console before. It is sci-fi technology that Microsoft will be spending a lot of money to support for a while. Kinect isn't going away, so you might as well try it at some point. You might just love it. Does it work well? Or do you have to be in a lab to get it to operate right? Kotaku editor-in-chief Brian Crecente and I each used Kinects in our home with a variety of games for about a week before the November 4 launch. We've both had issues with some Kinect games not recognizing a gesture here or being slow to respond to another. We've each had the voice-control fail us once in a while, forcing us to repeat whatever we barked at the Kinect. He's had it worse, seeing some games simply break, like the time Kinect Sports didn't let him detach a virtual bowling ball from his virtual hand. But it is impossible to say if the flaw is in the Kinect hardware or in the games. Some games, such as Dance Central and Kinectimals, are polished and seldom show cracks. Others suffer. Such are the problems that happen at the launch of hardware and software. Only time can reveal where improvements can and will happen. Is this basically the Wii all over again? Sort of. The Wii was a shock to gaming. Motion control was not mainstream, and Nintendo smartly introduced it to the masses with a small number of games that worked well with a small number of gestures. It succeeded magnificently because of that relatively conservative strategy. Kinect, on the other hand, is as ambitious as it is scattershot. Ignore the gaming aspects and Kinect still feels important as a viable new way to use voice and gesture to control downloaded movies through the Xbox's Zune channel or to watch sporting events streamed through the regional ESPN3. But the options for control input with gesture and voice are so broad, and the line-up of launch games so diverse, that Kinect fails to do any one thing excellently. There's no Wii Sports in the line-up. Is it the Wii again, though? Well... there's a workout game, a sports compilation, an arcade racer and so on... the imitation is shameless. Does it replace the game controller? No. Some Kinect games feel like they'd be better with a controller. Others, like Dance Central, wouldn't be as fun. A comparison to a controller is apt, though, because gesturing to control a game feels as relatively convoluted and slightly slow as using a control stick. Kinect voice control, on the other hand, feels like it can be as precise as pressing a button. Buttons and control sticks together are a great combo; voice and gesture feel like just as terrific a pairing. This is the right Kinect combo, and it's a pity the launch games go so heavy on gesture and so light on voice. The worst knock on Kinect seems to be that it needs a lot of room. True? Sadly, yes. You can play single-player Kinect games at the same distance you've held a wired game controller plugged into a game console. For multiplayer or for more dynamic dancing and workout games you need more space than you do to play four-player Wii Sports tennis, more space than you need to jam with a full group in Rock Band. Can you fit a pool table in front of your TV? You'll need about that much real estate, because the Kinect sensor needs to see you. Can't be too close; can't be too far to the side. Be it my Brooklyn condo or Crecente's more standard-sized Denver house, we both had to adjust our living rooms to fully enjoy Kinect. Those with cramped quarters could find Kinect to be a non-starter. Microsoft says this is essentially a new console, that Kinect is a new platform. True? Maybe, but it's at least right to say that Kinect is launching the way a new console does: with raw potential and some half-baked execution. At launch you can discover wonderful details, like the fact that Dance Central and Kinect Joy Ride pause when you step away from your TV. But you can also find frustration at games that don't share the same methods for skipping cut-scenes or advancing through menus. Without a controller in your hand, you will feel less capable of figuring out what's wrong, of tapping a button with elevator-door-close urgency to remedy a situation. It's confusing to be using a Kinect on day one. You may fall in love with the voice control, as I did, but then switch from ESPN to Zune and discover that the former doesn't use the same voice controls as the latter. These wrinkles need ironing. But the million-dollar question is: Is it worth $150? The Kinect comes with a full game, Kinect Adventures, which will take some of the sting out of the price. But it also comes with the inconsistencies described above and the lack of a killer app, the lack of a perfect game. At launch, Kinect merits a visit to your friend's house if you hear he or she has it. But it's not must-own yet, more like must-eventually own. It was ironic that in searching for an electric socket in which to plug my Kinect a week ago, I had to unplug my Wii. I now need to find a second socket. Kinect doesn't replace the Wii any more than it does an Xbox controller. It's not even a sure thing as a games platform, not until it has its first great game. But it doesn't have to be. If Kinect becomes nothing more than a replacement for the TV remote, it'll prove to be a winner. For its launch price, though, it needs to be more. If Microsoft keeps supporting it, and if its flaws can be patched and improved through software, Kinect can be revolutionary. Kinect was developed by and published by Microsoft for the Xbox 360, released on November 4. Retails for $149.99, bundled with a copy of Kinect Adventures. Two Kinect sensors were given to us by Microsoft for reviewing purposes. We used Kinect extensively for the better part of the week. Came for the gesture control; were won over by the voice-control. Kotaku has more reviews, hands-on impressions and video of Kinect in action right here.